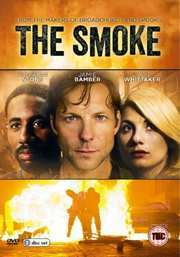 We kick off the week in news with one arriving on 14th April courtesy of Acorn Media, the Sky One drama series The Smoke, arriving on DVD. Written by Lucy Kirkwood, this stars Jamie Bamber, Jodie Whittaker, Rhashan Stone, Gerard Kearns, Pippa Bennett-Warner, David Walmsley, Dorian Lough and Taron Egerton. With a total runtime of 400 minutes, this comes with a recommended retail price of £19.99. This is a show about ordinary men and women, about fire-fighters, and heroes, about life and death stories of risk and rescue. Charged with adrenaline, gut-wrenchingly emotional, surprisingly funny, and often outrageously audacious, it’s a show with big thrills, huge heart, and characters who leave an indelible mark. Kev Allison is a seasoned fire-fighter and the leader of the crew at White Watch. Being a hero is part and parcel of how he sees himself as a man. It's in his blood and who is he is. But his life is about to change when he's called to the worst fire of his career, and every belief Kev held sacred about being a firefighter and serving the public, is about to be turned on its head. Trish is Kev’s girlfriend, who is striving to hold on to love and hope against the odds, while Kev’s best mate Mal;s loyalty is tested to the extreme. Then there’s the rest of the watch... Little Al, Ziggy, Rob, Billy and the mysterious Dennis, the new boy on the team who has something to hide.